The Cumberland & Dumfriesshire Farmers Mart P.L.C. had forward 65 prime cattle, 30 over thirty month cattle, 4,670 prime hoggs and 3,991 cast ewes & rams at their weekly sale at Longtown on Thursday 15th April, 2010. Clean cattle met a similar trade. Limousin heifers to 177.5p, 174.5p, 173.5p Dashwellgreen, others 171.5p Beckhall; British Blues 173.5p Beckhall. Limousin bullocks 167.5p The Gill and £1220 Fenton, £1204 No 6 Stonehouse. An improved show of OTM saw trade sharper on the week and averaged 104.6p over all. Top price to 137.5p (£880) for a Charolais heifer from E. & A. Graham, Upper Mains; Hereford 125.5p (x2), 118.5p Enzieholm. Cows to 129.5p (£1,197) for British Blue from J.F. & S.J. MacDonald, Ladyhousesteads; Charolais 127.5p, 123.5p Blindhillbush; Limousin 121.5p Greenleycleugh, 117.5p, 115.5p, 113.5p Ladyhousesteads; Simmental 111.5p, 110.5p Sceughdyke; Friesian 91.5p Hilltop, 87.5p Plumpe and Peterscrook; Galloway 81.5p Greenleycleugh. The 4,670 prime hoggs sold to the usual full ring of buyers. The sale was dominated by plainer types, however the sale still levelled out at 196.4p. Good quality export types were in short supply and regularly sold between 200p and 230p per kilo and were easily sold. Top price of 268p per kilo for Beltex’s from Messrs T. Wilson, Blackrigg and to £117.50 for Texels from S. Stoddart, Hillside, others £116.50 Hillside, £108.50 Baltier; Beltex £112.50 Blackrigg, £109.50 Main Office and Hill Side; North Country Cheviot £103.50 Ericstane, £102.50 Whitton; Greyface £100 Main Office, £91.80 Justicetown, £89.50 Finnieness; Charollais £99.50 Moss Side, £98.50 Broomhill, £96.50 Mouldy Hills; Suffolk £98.50 Newbigging, £96.80 Sceughdyke; Hill Cheviot £94.80 Justicetown, £92.80 Shaw Head, £91.80 Bloch; Half Bred £93.50 Ericstane; Blackface £92.80, £91.80 Smalmstown; Bleu d’Maine £91.50 Stackbraes; Kerry Hill £89.50 Riggshield; Herdwick £86.50 Millbeck, £85.50 Hillside; Swaledale £83.80 Whitton, £78.20 Farney Shield, £76.80 Kirkland Green; Cheviot Mule £83.50 East Durran, £80.50 Newbigging. The 1,527 lightweight hoggs sold to a top of £83.50 for Beltex’s from Kelmore Hills, others £78.80 Netherwood; Texel £75 Kirkland Green, £73.20 Cara View; Hill Cheviot £74.80 Shaw Head, £69.80 Low Cairndoon and Tushielaw; Blackface £73.80 Newbigging, £68.80 Graystale, £67.80 Netherwood; Suffolk £72.80 High House; North Country Cheviot £68.80 Tister; Greyface £67.80 Tister, £66.50 Crawfordjohn Mill; Swaledale £65.80 Kelmore Hills; Herdwick £64.80 Millbeck. A larger show of 3,991 cast ewes and rams sold to the usual full ring of buyers. Trade was slightly easier on the week and similar to that of a fortnight ago, but all classes were still easy to sell. Top price of £168.50 for heavy Suffolk ewes from Rashee, others £166.50 Bluebell and Severs; Rouge £159.50 Rashee; Charollais £158.50 Maryholm, £156.50 Newbigging; Texel £154.50 Rashee, £152.50 Sockbridge Hall; North Country Cheviot £144.50 Sockbridge Hall, £130.50 Church Road; Leicester £142.50 Dunjop, £100.50 Skirling Mains; Half Bred £136.50 Waterloo; Bleu d’Maine £128.50, £122.50 Dunjop; Wensleydale £116.50 Road Side; Lleyn £110.50, £98.50 Westhills, £86.50 Guards; Greyface £108.50 Fenton Farm, £104.50 Barrackend, £103.50 Newbigging; Oxford £104.50 Guards; Beltex £100.50 Seavers, £98.50 Mouldy Hills; South Down £96.50 Croft House; Cheviot Mule £93.50 Outertown; Zwartbles £86.50 Pallet Hill; Woodland £80.50 Low Tirfergus. Goats to £83.50, £62.50 Coytre. 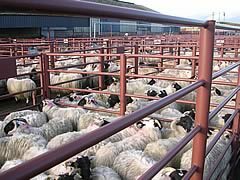 Hill ewes to £94.50 for Cheviots from Waterloo, £93.50 Seavers; Blackface £86.50 Sockbridge Hall, £83.50 Leahaugh; Swaledales £78.50 Kelmore Hills, £77.50 Knells, £74.50 Croft House; Jacobs £62.50 Alton. Texel Rams to £160.50 Eastside, £158.50, £148.50 Roadside; Charollais also to £160.50 Severs, £136.50 Coytre & Eastside; Leicesters £116.50 Chapel & Whitton; Suffolk crosses £129.50, £128.50 Coytre, £115.50 West Lyth; Suffolks £138.50 Severs, £128.50 Eastside, £119.50 Rashee; Cheviots £94.50 Eastside, £80.50 Bloch; Blackfaces £80.50 Graystale, £76.50 Whitton & Linhope; North Country Cheviots £118.50 Waterloo & Whitton, £90.50 Rhemullen; Beltex £128.50 Severs, £126.50 Tiffinthwaite.